I haven't linked up with Farley at Oh' Boy 4th Grade for this Currently linky party since August! We had a short week this week but it sure felt long since the kids were CRAZY! The day after Halloween was nuts, plus we had Mass since it was All Saints' Day. Wednesday and Thursday we had half days and then conferences, and the second the kids got to school, they were ready to go home. Plus, on Wednesday we normally have technology in the morning and music in the afternoon, but they rescheduled music to the morning, so I hardly got anything done on Wednesday between the two specials and morning recess!! This weekend I've been perusing Words Their Way. Could this be the answer to my frustrations?? Do you use Words Their Way? I think I'm going to do the primary spelling inventory on Monday and use the data to make little groups. If you have any words of wisdom, I would LOVE anything you have to share! Just stopping by to see what you are "Currently" doing... and you are one blog I'm stalking!!! Come by when you can. thanks for joining the party!!! and hope you feel better soon!!! I love Words Their Way! The word and picture sorts are wonderful! 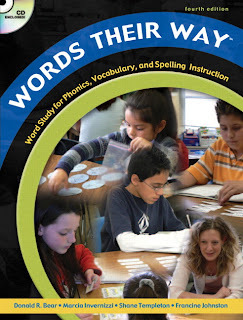 The CD that comes with the book is also awesome because it allows you to make your own word work games and also keep track of students' progress in a database. Sorting is an awesome way to teach word work. The spelling inventory will give you lots of useful information on what skills specific students need to work on most (initial consonants, blends, digraphs, vowels, etc.) and hopefully you'll be able to group students from that. Good luck-let me know if you ever have any questions-I'll try to help! I have no idea what Words Their Way is about. At my school, I don't even get to say Words My Way. I have to read a script. WAAAA! We have the 4 book set of Words Their Way. If you have a multiage/ability group, I think this program will progress your kids nicely as far as spelling/phonics goes. Have you considered readinga-z.com to differentiate in your classroom? Words Their Way is a great program. Even if you don't use their words, the ideas are great.